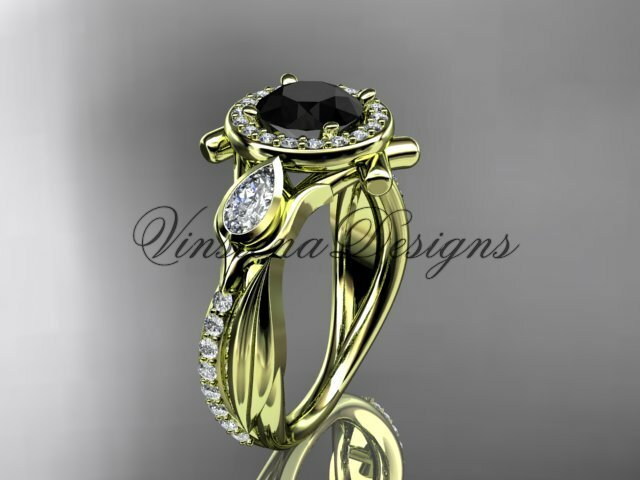 Beautiful in every given way, this diamond leaf and vine, tulip flower engagement ring is made of solid 14kt yellow gold, with 1.0 ct Round cut Black Diamond center stone, perfectly set in a stunning 14kt yellow gold band. It has 34 VS-SI/G-H color diamonds total weight of 0.34ct. It has 2 pear shape VS-SI/G-H color diamonds total weight of 0.32ct.